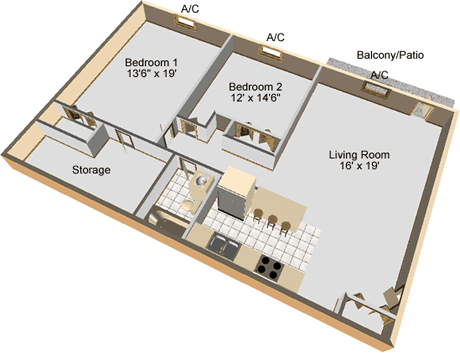 Our 2-Bedroom units are spacious and modern, with 2 large bedrooms, roomy living room and kitchen with breakfast bar. 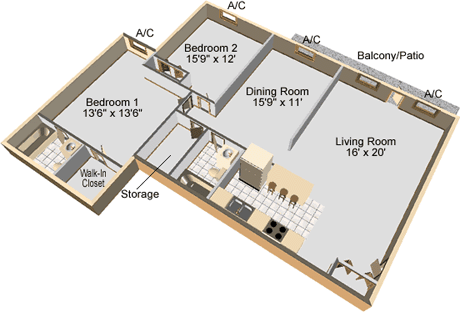 These units offer plenty of closet space with big closets in both bedrooms and another closet by the door. You also get a large walk-in storage room right inside the apartment – great for keeping your bike and other items in reach but out of your way. Plus, the 14-foot balcony or patio right off your living room – a wonderful place to unwind after a busy day. If you like the sound of our 2-Bedroom Apartment but may want a little more space, check out our Deluxe 2-Bedroom Apartment. Our Deluxe 2 Bedroom units are so big, you’ll feel like you live in a house. They include a spacious master bedroom suite, a roomy 2nd bedroom with a big closet and there is a large storage closet right inside the apartment. The open, airy floor plan is perfect for entertaining, with a spacious living room and dining room, modern kitchen with breakfast bar, plus an 18-foot balcony or patio so you can relax in style. If you do not entertain often, the dining room makes a perfect space for a home office or tv room.